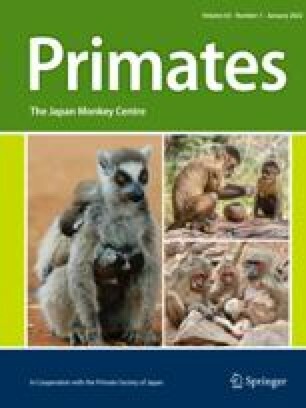 Identification of vocalizers was examined using an auditory-visual matching-to-sample task with a female chimpanzee. She succeeded in selecting the picture of the vocalizer in response to various types of vocalizations: pant hoots, pant grunts, and screams. When pant hoots by two chimpanzees were presented as a "duet", she could identify both of the vocalizers. These results suggest that researchers have underestimated the capability of vocalizer identification in chimpanzees. The chimpanzee correctly chose her own pictures in response to her vocalizations only by exclusion, and she did not show vocal self-recognition. The effect of acoustical modification (pitch shift and filtration) on the performance suggested that pitch is an important cue for the vocalizer identification. We thank Dr. Noriko Inoue-Nakamura for providing us with recordings of pant hoots made in Africa. This study was supported by the Human Frontier Science Program (principal investigator, Dr. Vittorio Gallese), and a Grant-in-Aid for COE Research (no. 10CE2005) and a Grant-in-Aid for Scientific Research (no. 13410025) to S.K. by the Ministry of Education, Culture, Sports, Science and Technology of Japan.